Many patients suffer some degree of stress when they have to visit the dentist but, for a minority of people, the level of anxiety they experience is a real deterrent to their seeking treatment. Such people typically report the classic symptoms of panic attacks when visiting the surgery – for example sweating and nausea. It is important to appreciate that these reactions are involuntary, rather than simply being a case of undue squeamishness, and patients who are affected in this way cannot simply be expected to "pull themselves together" - it is first necessary to address the underlying anxiety before treatment can begin. The good news is that, with today’s advanced dental sedation techniques, almost all such patients can be successfully treated and enjoy the benefits of good oral health and a great smile! Sedation is quite distinct from general anaesthesia. Many older patients may remember the formerly widespread use of the latter in general practice for extractions (usually involving the administration of nitrous oxide or "laughing gas"). Clinical guidance has since confined the use of general anaesthesia to the hospital environment. Consequently the emphasis in general practice has more recently been on the provision of sedation where, by contrast, the patient remains conscious and able to communicate but is in a state of deep relaxation and extreme drowsiness. The procedure is quick and recovery is also relatively rapid. There are also far fewer chances of complications arising than is the case with general anaesthesia. Q. How is the sedative normally administered? A. This will depend on the individual patient but the tranquilising agent is usually given intravenously or intra-mucosally (nasally). The process is quite painless. Q. 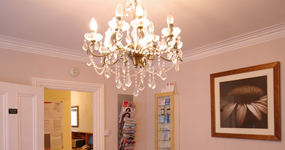 Can treatments other than extractions be undertaken under sedation? Q. Is sedation available for children? A. We are usually able to offer sedation to all but the youngest children. Please call to discuss with Dr Booyens. Q. How long does it take to recover? A. The majority of people recover within one and a half hours. All recoverees are supervised during this period to ensure the process is problem free. Q. Are there any unpleasant side effects? A. A Some degree of amnesia with regard to the treatment itself is common but many people regard this as a positive feature. Q. What is the first step in the process? A. We begin with an initial consultation which includes the taking of a full medical history to ensure the procedure is problem free. Treatment would then be undertaken at a separate later session to allow the patient the opportunity to first fully consider the options. Q. Is sedation suitable for all adult patients? A. A small minority of patients (for example those who have uncontrolled high blood pressure) may not be able to have sedation for medical reasons. Q. Is there a separate fee payable? A. Fees for sedation are obviously additional to those for the procedure in question. A full estimate will be given before treatment is commenced.